Shenzhou 6 astronauts Fei Julong and Nie Haisheng sit in the crew module of thier spacecraft clad in spacesuits. After oneday in space, the two astronauts aboard China's Shenzhou 6 spacecraft have alreadyracked up a series of firsts for their country's space program, not the leastof which began with leaving their seats. Circlingthe Earth in a 213-mile (343-kilometer) orbit, Chinese astronauts Fei Junlongand Nie Haisheng conducted a day of observation and science in the orbitalmodule of their Shenzhou 6 spacecraft, according to state media reports. The twoastronauts, both former fighter pilots, launchedinto space on China's second manned spaceflight at 9:00 p.m. EDT on Oct. 11 (0100Oct. 12 GMT) from Jiuquan Satellite Launch Center), though it was 9:00 a.m. Oct.12 local time at the pad when they lifted off. The astronauts are slated tospend up to five days in space during their mission. The flightis aimed at demonstrating China's space prowess - the country is only the thirdnation to independently launch a human into orbit - and the prestige of itscommunist government. Shenzhou 5, China's firstmanned spaceflight, launched astronaut YangLiwei on a 21 ?-hour mission on Oct. 15, 2003. Nine hoursafter the successful launch, Fei unstrapped himself from his chair and floatedinto Shenzhou 6's orbital module, and later switched positions with Nie, China'sXinhua News Agency reported. The crew'smovements marked another step in China's human spaceflight efforts. While Feiworked in the orbitalmodule, Nie used a digital camera to take photographs of the flight, Xinhuareported, adding that both astronauts were expected to have taken off their22-pound (10-kilogram) space suits. "Itsuggests that the orbital module is functioning as expected and that's good," DeanCheng, a China space specialist with CNA Corp. in Arlington,Virginia, told SPACE.com Wednesday. "It certainly means that the Shenzhou is going to be able to keep its crewoccupied." 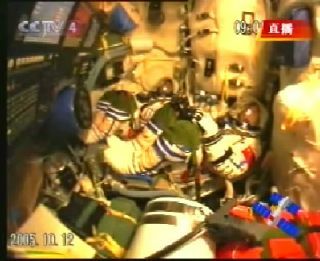 During the Shenzhou5 mission, Yang spent the entire time in the spacecraft's crew compartmentand strapped in his chair as part of the test flight. "Thissecond mission expands on [China's] ability to test life support systems," saidJoan Johnson-Freese, who follows China's space efforts and chair ofNational Security Studies at the United States Naval War College in Newport,Rhode Island. "Now they've established that [Shenzhou 5] was not a one-timedeal." China's Shenzhouspacecraft borrow a basic design from Russia's Soyuz spacecraft, but are tailoredwith new systems and equipment. They consist of a primary crew-carrying reentrymodule, an orbital module and a service module. Shenzhou 6'sorbital module reportedly contains experiments and equipment, a food heater andother new equipment to be tested on this flight. It carries its own solararrays and could stay in Earth orbit for a prolonged period, experts say. Johnson-Freesetold SPACE.com that Shenzhou 6 pushes China past its first phase ofspace development and on a path that could likely lead to ever-more sophisticateddemonstrations, including spacewalks and dockings and ultimately a hook-up ofits orbital modules into a flying space lab. "I think we'llfind out in due course [whether] they are going to detach from the orbitalmodule and undertake a few maneuvers while they are still in orbit," Cheng saidof the Shenzhou 6 crew, adding that he does not expect a docking demonstration forthis flight. "That would be remarkably ambitious for a second flight." Fei and Nieare expected to perform a series of physical exercises inside the Shenzhou 6orbital module as well as life science tests to evaluate the effects ofweightlessness, Xinhua reported. Photographyand biological cell tests are also slated to be performed throughout themission. The scienceexperiments are the first to require astronaut interaction and are key if Chinais to proceed toward future human space exploration, China space officials havesaid. WangYongzhi, who heads China's manned space program, told Xinhua that theShenzhou 6 experiments will explore how astronauts adapt to the spaceflightenvironment and return data that is vital for the development of a permanentspace station. On a tastiernote, Fei and Nie have a far wider range of food available to them for this flightthan Yang,according to state press reports. The People'sDaily Online and Xinhua reported that about 88 pounds (40 kilograms)of food rode into orbit aboard Shenzhou 6 to provide three meals of up to sixdishes each for Fei and Nie. While ricewill be a staple - it comes sealed in five-ounce (140-gram) amounts - beefcooked in orange peels and vegetables are also on the menu along with coffee,green tea, orange juice and other fruits, Xinhua reported. State pressaccounts have also reported that the two astronauts will sleep in shifts duringtheir multi-day mission. Earliertoday, the Shenzhou 6 astronauts spoke from space with family members atBeijing Aeroespace Command and Control Center during a brief communicationssession, state media reported. "We are allpleased to see both of you are in good spirits," said Wang Jie, Fei's wife, Xinhuareported. "Meanwhile, we all feel very proud of you." Fei thankedhis family for their support, and made plans to go fishing with his son Fei De,who asked how the astronaut felt in weightlessness, Xinhua stated. "I feelfine," Fei said, according to state media. Nie wasreportedly moved to tears while speaking with his wife Nie Haisheng andlistened to a birthday song from his daughter Nie Tianxiang, Xinhuareported, adding that the astronaut turns 41 on this spaceflight. Accordingto Chinese press reports, the Shenzhou 6 crew - like Shenzhou 5's Yang Liwei -are already national heroes. In Zaoyang,Nie's hometown, in China's central province of Hubei, revelers let loose 1,000pigeons and balloons in front of the astronaut's house, Xinhua reported. "I wasvery nervous when the launching process began, but now I feel so excited andproud of my brother," said Nie Daozhi, the astronauts sister, told Xinhua,adding that her entire family looks toward his safe return. The Xinhua News Agency and otherstate media contributed to this report.